Painting your home’s interior trim or molding can dramatically change the look and feel of a room. Whether you want to change the color of your baseboards, window trim, door frames, crown molding or cabinets, professional interior painters can provide these trim painting services and more. Before you contact a professional painting company to work on your next trim painting project, it’s important to determine an interior trim color that looks perfect with your walls, ceiling, and furnishings. 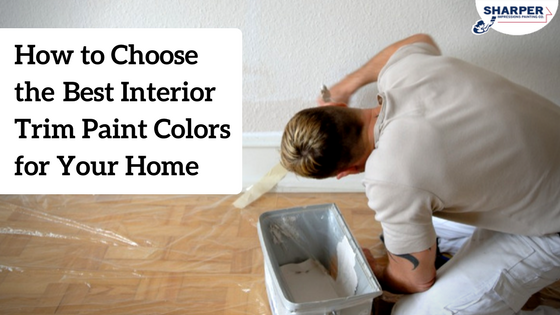 The following interior trim painting ideas and tips can help you choose the best trim paint color for any room in your home. White trim is by far the most popular choice amongst home owners as it can give any room a classic look that matches practically everything. Whether you have bright, soft, or pastel walls, white trim paint will work to create subtle contrast. And if your wall paint is bold or intense, white trim can bring a lighter look to the room. If you simply can’t decide on the perfect color for your trim, white is always a great fallback that won’t let you down. White on trim is timeless. Trim painting tip! Not all white paint is created equal. There are many shades to choose from whether you need cool, warm, or creamy undertones. A free in-home paint color consultation can be helpful if you need extra help picking the right trim color for you. When choosing paint trim color for a small space, consider a color that is the same hue as your walls. Not only will this technique make the room appear larger, but it will also give it a modern look and the feeling of a more unified space. Be sure to choose a glossier finish for your trim so when the light hits, the trim can still stand out while up against walls of the same color. If you want to create a contrasted look or bring focus to your windows or door frames, choosing a trim paint color that is darker than the walls of a room can be an ideal choice. Try a dark hued paint that is several shades darker than your wall paint to create a sense of depth. Or if you have an older home, consider having professional painters paint woodwork in a dark mahogany or black-brown to bring out the intricate details. While white is the most popular neutral trim paint color, there are other neutral hues that can create a look and feel that white can’t achieve on its own. Black: A neutral paint color that can also be quite bold is black. If you want to make your crown molding or window trim pop, black can be an ideal color. Just be sure to use black with white or light-colored walls to create the perfect balance. Black trim can provide exceptional contrast to any room that contains an ample amount of trim and molding. Gray/Charcoal: If you want a more elegant look, pairing a light gray trim with white walls, or dark gray with light gray walls can provide a touch of class to any room. Cream/Beige/Brown trim: You can’t ever go wrong with a cream, beige, or brown trim color as long as the walls and ceiling of the room have the same undertones as your trim paint. Trim painting tip! If you want to create a more intimate feeling in a room, a neutral color that matches your ceiling can be an excellent option. If you’re bored with neutrals, you can always go bold with your trim. When your walls are painted white or a light color, boldly colored trim can create some much-needed contrast. White, or light-colored walls give you a blank canvas and free reign to paint trim any color under the sun! If you feel like being bold, choose a fun trim paint color that matches one of your favorite throw pillows or a focal furniture piece. Don’t be afraid to get creative! Try greens, blues, yellows, purples, pastels — the possibilities are endless if you aren’t one to shy away from color. What is the best sheen for trim? Trim and molding can help define a room’s style, so it’s important to choose a paint sheen that helps it stand out from the walls. A gloss or semi-gloss sheen is always the most popular for trim. It works incredibly well on interior trim since it has a reflective quality. Not only that, but glossy trim paint is highly durable which can be beneficial in high-traffic areas of your home for those bumps, nicks and scratches that happen to trim in every room. Trim painting tip! Older homes tend to have woodwork imperfections, so using a lower satin sheen on your trim is always a good idea if you wish to disguise cracks, chips, or other blemishes. If your interior trim needs a paint touch up, or you want to bring a pop of color into your home, professional interior painters offer trim painting services that can meet your needs. Experienced professionals can give your trim the transformative look you desire, and the durability to stand up against everyday wear, cleaning materials, kids, and pets. Whether you need to revamp your entire house, or just one small space, every room will look its absolute best with a professional trim painting team in your corner. Get a free trim painting quote today.